Grand Excursion Preview Reno to Dakota, Minn. The southernmost Minnesota settlement on the Mississippi, Reno, backs into a little notch below the rocky bluffs. Much of the surrounding blufftops and woods are state forest land. Brownsville (pop. 517), a few miles upstream, was once a thriving rivertown, with several banks and hotels and a large meat packing plant along the river until a fire destroyed most of the town in 1920. The bottoms downriver from Brownsville have attracted increasing numbers of tundra swans and bird watchers during the last few fall migrations. Genoa, Wis., (pop. 263. Locals pronounce it je-NO-ah.) was settled by Italian fishermen. Just south of town, below Lock and Dam 8, one of the nations first commercial nuclear power generating stations, now deactivated, sits in a small domed building next to the larger coal-fired generating plant owned by Dairyland Power Cooperative. The Genoa National Fish Hatchery, about 3.5 miles south of town, is the site of important river fish and mussel research. Part of Stoddard (pop. 815), upriver from Genoa, stretches along the river west of the railroad tracks. The biggest city on this stretch of the river is La Crosse, Wis. (pop. 51,818), named after a rough-and-tumble game the Indians played on the prairie there. Another rivertown, Baton Rouge, La., means red stick in French, named after the stick used to play lacrosse. Like most of the other towns on the region, La Crosse was first settled in the early 1850s, and grew up as a busy steamboat landing, though there were fur trading posts there in the previous century. Both the La Crosse and the Black rivers flow into the Mississippi at the city, which later became a major lumber milling town and transit hub when the railroad reached the river there. 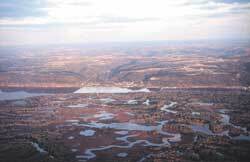 Today, La Crosse retains many connections with the river. A major pleasure boat manufacturer calls the city home, and a busy grain shipping terminal attracts towboats and barges. The U.S. Fish and Wildlife Service maintains a district office there, and the Upper Midwest Environmental Sciences Center is the base for extensive river research. The University of Wisconsin-La Crosse also has a River Studies Center and its Murphy Library houses a Special Collections and Area Research Center, which includes extensive riverboat photographs and regional historical resources. Not much is left of Dresbach and Dakota, just upstream. Most of the narrow strip of land the towns occupied between the bluff and the river is now part of Interstate 90. Across the channel from Dresbach, Lake Onalaska lies separated from the river by a narrow chain of islands. The biggest island in the lake is named Red Oak Ridge, because it was once a small ridge above a sandy prairie near the shore of the river. The prairie was flooded by the creation of Lock and Dam 7. The dams spillway, at the city of Onalaska (pop. 14,839), is a popular fishing spot. The Environmental Management Program built three sets of islands in this stretch of the river: three islands were completed in Lake Onalaska in 1989; three large islands were completed just west of the Main Channel below Brownsville in 1992; 26 acres of islands were completed near Stoddard in 1999.